***Update*** Ela’s mom’s duck came in first at the 2013 Ducky Derby and she won the brand new Malibu!! 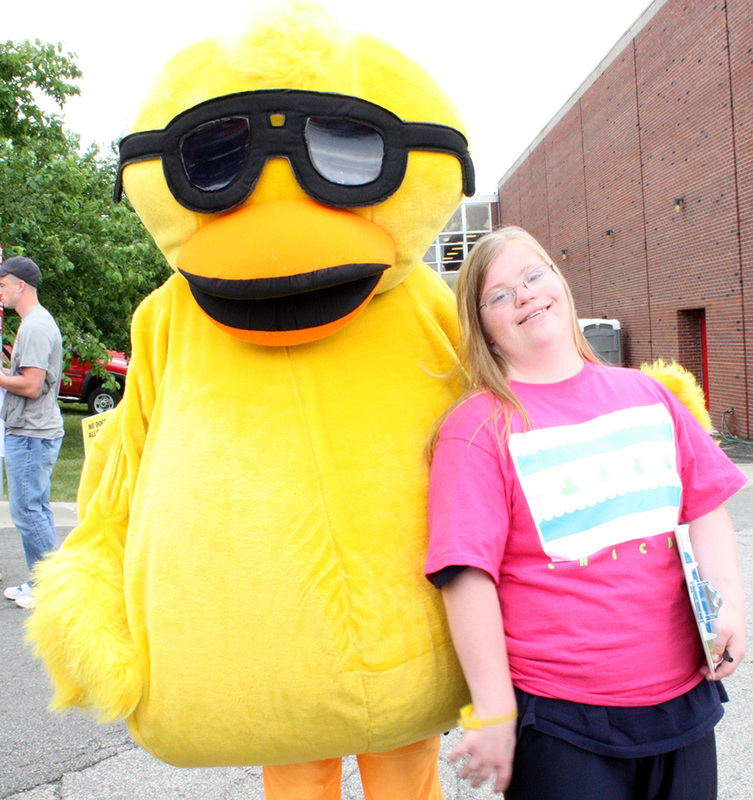 Last year when Special Olympics athlete Ela Stoklosa, 23, of Wheeling started selling duck “adoptions” for the Windy City Rubber Ducky Derby Darling Ducklings team, her family looked for a unique way to say Thank You to those who donated to her fundraising efforts. Ela’s sister, Kristina, enjoys baking and has a home-based business making cookies for events like baby showers, so they settled on duck-shaped cookies as a “goodwill gesture,” said the girls’ mother Theresa Stoklosa. It was definitely more than they bargained for. The appreciation gifts evolved into a family affair drawing in every member of the Stoklosa family – mom Theresa, dad Stan, brothers Steve and Matthew, in addition to Ela and Kristina. “We had cookies cooling on every flat surface of our house waiting to be frosted,” said Theresa. Ela and Kristina did the baking, while everyone got involved in the fun of frosting and packaging the cookies. “It was a great experience because Ela learned to bake in the process,” said Theresa. Each cookie was inserted into a baggie with blue paper in the bottom to signify water. “We had quite an assembly line going at our house,” Theresa said. Each baggie also included a Thank You note from Ela. “In the beginning, Ela wrote each one. After a while, we copied them and just had Ela sign each one,” said Theresa. Ela admitted that her hand got quite sore from signing all those notes. Finally, the whole family got involved in delivering the cookies. Those going to out-of-state donors were shipped, while Ela and her brothers delivered the rest in the Chicagoland area. Ela has participated in Special Olympics for nearly 10 years, competing in basketball, volleyball, cross-country skiing, soccer, floor hockey and athletics. She was a part of the female basketball team competing at the 2008 National Games in Nebraska. She became a Global Messenger in 2011. Stan said Ela’s Duck Derby “adoption” sales really gained momentum as more and more people learned of her cookies. 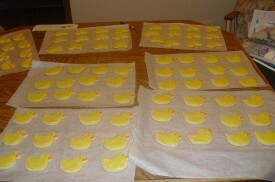 And, the family made 200-300 cookies for a Special Olympics Duck Derby wrap-up party last fall.